Every January, Americans make their News Year’s Resolution to lose weight and eat healthier. 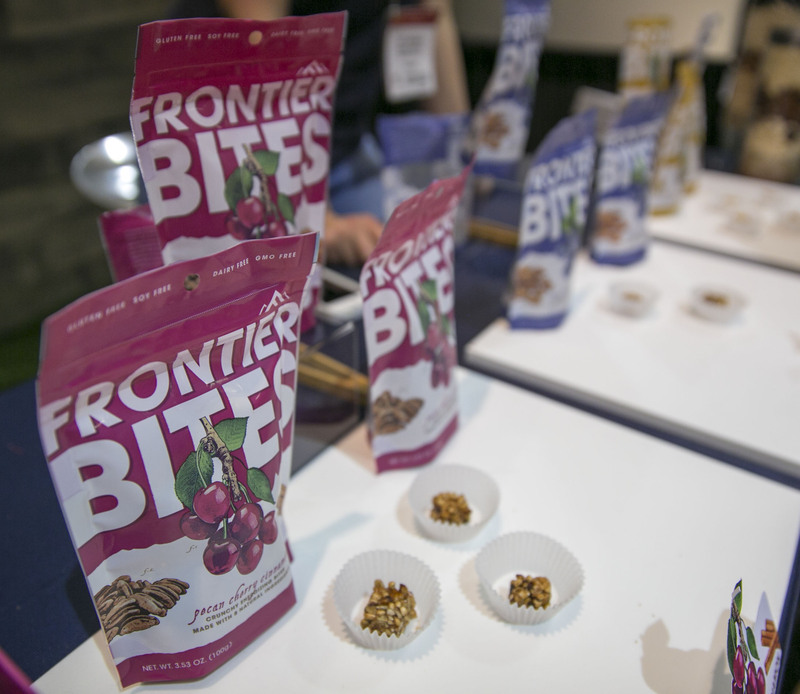 At the 2015 San Francisco Winter Fancy Food Show, there were plenty of healthy snacks to sample. As thousands of exhibitors look to fill our local markets and specialty stores with their newest products, Bay Area food companies have figured out a way to give consumers something sustaining to eat in-between meals. Here are some notable noshes that will help you make your calories count. Two years ago, Oscamou brothers – Nate and Matt – entered into a friendly competition. The rules were as follows: to make a snack using no more than 10 all-natural ingredients, that are dairy, soy, and gluten free. The competition was spurred upon their desire for a healthy, light snack to power their active lifestyles. As foodie enthusiasts, they went into the competition blazing ahead. Nate happened to be the winner, creating an almond blueberry lemon flavor snack. With this winning snack, the brothers were motivated to build a company as partners. 3 months before launching Frontier Snacks, Nate passed away in a kayaking accident. Matt has continued to build out the product line and carry on the business in memory of his brother. Matt, proudly acknowledges that the almond blueberry lemon flavor is a favorite amongst customers. Frontier Bites contributes back through sponsoring a Bay Area Women’s Cycling Team as well as supports 5ks, 10ks, and half marathons. Beyond this, Matt gives 1% of Frontier’s profits to the Knolls Foundations. Knolls gives inner city kids a chance to experience and embrace the outdoors, so they will become stewards of nature. Matt’s mission is to encourage Bay Area residents to live healthy and actively. Laughing Giraffe, may be a funny name for a snack company but CEO, Chelsea Marshall, is taking her family business quite seriously. Their goal is to bring gluten free, plant based, and raw snacks to the American market. Chelsea’s father, Phil Gilmour, wanted to make healthier food choices when he retired, so he purchased the business from the founder Chief Chef, Justin Baumgartner. Similarly, Chelsea wanted to incorporate nutritious foods into her active lifestyle, as well as be a role model to her 4 children. The product line called Snakaroons are rich in nutrients, high in protein, and contain good fats needed for consistent levels of energy. The snacks are all-natural and come in the following flavors: Chocolate, Vanilla, Lemon, Banana, Pineapple, and Goji Maca. They also have introduced Snakarola with unique fusion flavors, like: Cherry Ginger, Cranberry Orange, and Curry Cashew. When you purchase products from their online store, they donate 1% of their sales to The Gentle Barn. This non-profit organization helps to rehabilitate farm animals which endured severe abuse, neglect, and abandonment. Through programs at their Santa Clarita (Southern California) location, they invite inner city and special needs children to interact with the animals to learn about empathy, respect, and compassion. The Gilmour clan is on a serious mission with Laughing Giraffe Organics personally, professionally, and socially. loping a line of power snacks by melding their superfoods using date paste. Zach Adelman, a Toronto native, was traveling through South America when he came across maca root in Peru’s high altitude. After implementing maca into his diet, he felt it sustained his energy throughout the day, and decided there was an opportunity to introduce this impressive root to North America. With almost 50 products, Zach, the CEO of Navitas Naturals sources directly from non-GMO farmers. Some of their products include: acai powder, cocoa beans, coconut chips, chia seeds, goji berries, superfood with nut blends, and more. At Navitas, “good food is medicine,” and they are excited about spreading this knowledge of unconventional, wholesome foods from around the world. They are committed to growing a more educated and energized community. With over 30 years of making all-natural, non-GMO, gluten-free tortilla chips and crackers, this family business is onto their second generation. Their offspring of new snacks for 2015 include: Savory Sweet Potato, Kale, and Harvest Cracker with 3 seeds. Many years ago, in a small community in the Santa Cruz Mountains, RW Garcia only made refrigerated Tortillas. Now, they have 3 manufacturing facilities with a line of dippers and crackers, plus they have grown to 170 employees. Their products are sold in North America, Europe, Asia, and Australia. RW Garcia donates husk/skins to pig farmers, recycles all their cardboard, and makes regular donations to local Food Banks. They even provided a whole truckload of their snacks to Hurricane Katrina victims. Two generations of Garcia’s take pride in being 30 years ahead of the healthy snack movement. The Keefer brothers (Mike and Tom) with their childhood friend, Dan Brinker, were looking for a fresh look at the potato chip industry. Through their combined knowledge of natural foods and finance, they collaborated to invent a baked crisp. Baked without oil, using a mix of buttermilk and organic wheat flour for the base, these crisps are savory and crunchy. By adding an assortment of dried fruit and nuts, it enhances the texture and additional natural, sweet flavors. Wild California sources quality ingredients locally, which has reduced their carbon footprint. In fact, the flour is created by Whole Vine from Sonoma, which contains grape seeds and skins leftover from winemaking in the region. Because Mike has worked for 35 years in dairy, he is committed to giving back to the community. As their business begins to grow, they will be donating 1% of their sales to small family growers in California. As healthy snack companies nibble and chip their way into mainstream markets, these food companies are serving up in-between meals that don’t fill you up with empty calories. For 2015, consumers have increasingly more options for finding healthy, tasty foods on their supermarket shelves. As demonstrated at the San Francisco Winter Fancy Food Show, many of these food companies are taking the lead on contributing to wholesome eating and a sustainable environment through their good practices. See our prior blogs from our 3-part 2015 Winter Fancy Food Show Series: 1) Dairy Good Practices and 2) Businesses Providing Greater Good(s). Also our Pinterest Board.